The Flitz Super Mini Büff Ball is a smaller version of the original Flitz buffing/polishing ball. Polish metal, plastic, and paint. 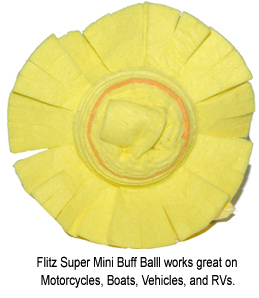 Home > Exterior Car Care > Wheel & Metal Polishes Plus Protectants > Flitz Super Mini Buff Ball 2 inches FREE BONUS! Flitz Super Mini Buff Ball 2 inches FREE BONUS! For a limited time only, receive a Flitz Metal Polish, Fiberglass & Paint Restorer 1.76 oz. Tube FREE with your purchase! Buff small or recessed areas with greater ease! The Flitz Super Mini Büff Ball goes where most polishing tools can’t with its compact polishing head and 8 inch extension shaft. Use the Super Mini Büff Ball to buff motorcycle components, spokes, engines and more. It buffs tight areas to a bright shine quickly and easily. The Flitz Super Mini Büff Ball buffs away polishes and waxes with incredible speed. The Italian Viscose tabs gently whisk away wax or polish haze from even the most recessed areas of your vehicle, motorcycle, boat, or RV. Viscose is a tough material that does not shed lint and resists tearing. If you accidentally buff over a sharp edge, the ball will not rip like foam pads can. The Flitz Super Mini Büff Ball will not overheat or cake up with product. The viscose is cut into multiple tabs of different lengths, which increases the ball’s surface area and its ability to buff away a lot of products before it ever needs washing. The Flitz Super Mini Büff Ball works on ALL surfaces - metal, plastics, Eisenglass, Plexiglas, painted surfaces, and more. The ball glides over textured surfaces without catching or tearing. Use it on large smooth surfaces to buff away wax faster than you can by hand. The round ball fits into concave areas and buffs over contours easily. The built-in, patented 8 inch shaft gives the Flitz Super Mini Büff Ball its long reach. The shaft is covered in a soft plastic sleeve that will not scratch any surface. The Flitz Super Mini Büff Ball attaches to any standard 3/8” or 1/2" electric drill or air tool. (tools not included.) The ball can be machine washed with your regular detergent or Pinnacle Micro Rejuvenator. Air dry. To use the Flitz Super Mini Büff Ball, attach it to your drill or air tool. Apply your favorite wax or polish to the desired surface. You can use the ball to work the polish into the surface, and then buff it off with a microfiber towel. Or you can apply the product by hand and buff away the residue with the Flitz ball. The ball works well as a polisher or as a buffing tool. Work at a speed of 2000 RPM to get the best results. Avoid buffing in the same spot for more than 30 seconds and avoid sharp edges to ensure long-term performance. Also available in a 3 inch diameter! See the Flitz Mini Buff Ball below. Wenol Metal PolishesDetailing Steel WoolPinnacle Exhaust Cleaner & BrightenerPoorboy's World Chrome PolishPoorboy’s World Aluminum & Metal Heavy Duty PolishWheel Wax Mothers California Gold All-Chrome CleanerMothers PowerBall Polishing Tool Mothers PowerBall Metal KitMothers PowerBall ComboMothers PowerBall 2 Pack with Mothers PowerMetal AluminumMothers PowerBall Chrome KitMothers PowerCone Chrome Polish KitMothers PowerCone Chrome ComboMothers PowerMetal Scratch Removing PolishMothers PowerBall Mini MD Mothers PowerCone Polishing ToolMothers California Gold Chrome Polish Mothers Billet Metal PolishMothers Mag & Aluminum Polish 10 oz.Mothers Mag & Aluminum Polish 5 oz. Unfortunately mini buffer ball doesn't hold up under normal use. Mini buffer ball doesn't hold up under normal use. The larger orange buffer ball is superior. Disappointed that mini buffer ball falls apart, started shredding on initial use. ProsSmaller size great for getting into tight places. Plastic shaft protector works well. ConsMaterial shreds quickly. Not worth the price of purchase. Worked great first time out of box..washed like instructed on package & when I went to use it the second time that thing threw yellow lint everywhere!!! I had bought 2 & thinking it was just a bad 1 I tried the second...SAME THING!!! O well ..live & learn..just my experiance..take 4 what its worth!! I bought this for detailing the chrome on my Harley. It does a so-so job of getting into the cracks/crevices. If you're going to use this, you'd better have some quality microfiber towels to finish the job. I do recommend it for its speed of polishing but have to say that it requires a thorough 'go behind' to make sure you get the job done properly.